Circular polarizers (CPs) are used to enhance the readability of emissive displays by suppressing internal reflections (by up to 99%) and improving the display’s contrast. *Circular polarizers are only typically used on LCDs when also using resistive touch screens. They must be properly oriented as the display’s output is linearly polarized. 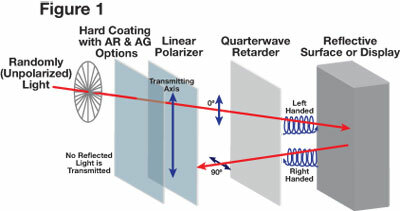 A properly oriented linear polarizer (LP) in an LCD application is a more effective means of improving contrast when a touch screen is not employed. Dontech’s standard circular polarizer is a 44% neutral density gray (i.e., having a total luminous transmittance of 44%, relatively neutral across the visual spectrum). These can be embedded in rigid substrates such as PMMA and glass. The LP component is iodine doped polyvinyl alcohol (PVA) type based LP. Dontech also offers a non-PVA (i.e., dyed LP) which will improve the environmental performance but will lower the polarizing efficiency. Dontech’s CPs can be further enhanced by laminating the neutral density gray polarizer to a color selective filter which has been optically matched to the applications requirements (e.g., display output). For instance, with an electroluminescent display, the circular polarizer may be combined with an amber long pass filter (typically color # A610). See Figure #2 for Dontech standard acrylic colored CPs. To assure maximum performance, it is essential that the linear polarizer within the circular polarized material be properly aligned with respect to the particular display and for the intended viewing of the display. Dontech standard circular polarizers are left-handed. The handiness of a circular polarizer is referred to as the “sense” of the CP. The circular polarizer may be described as left- or right-handed. CPs are always expressed as having handedness or helicity, which is determined by the position of the slow axis of the retarder being to the right or left of the linear polarizer as viewed from the retarder side of the filter. Dontech can configure a CP to either handedness. Dontech Engineering support is available for assistance with your polarizer selection and application design.